Join us for this continuation of our exciting small group seminar in the fall, with fascinating new material to discover. New and current participants are welcome! Alchemical imagery directly relates to the psyche’s transformation in the process of individuation, healing, and psychotherapy. C.G. Jung found a language of the psyche in the ancient tradition of alchemy. The irrational, imagistic, dynamic fantasies of the alchemists reflect the transformative movements of the psyche. These movements are happening right now, in the dreams, bodies, and fantasies of contemporary people. This seminar will review essentials, and then focus on alchemical images from alchemical manuscripts that Jung and others have mediated on. Each session will include conversation and images. 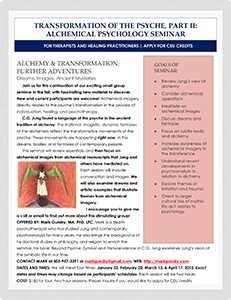 We will also examine dreams and artistic examples that illustrate themes from alchemical imagery. OFFERED BY: Mark Gundry, MA, PhD, LPC. Mark is a depth psychotherapist who has studied Jung and contemporary psychoanalysis for many years. He also brings the background of his doctoral studies in philosophy and religion to enrich the seminar. His book, Beyond Psyche: Symbol and Transcendence in C.G. Jung examines Jung’s vision of the symbolic life in our time. DATES AND TIMES: We will meet four Fridays from 3-5pm: January 30, February 27, March 20, & April 17, 2015. Each session will be two hours. COST: $180 for four, two-hour sessions. Please contact me if you would like to apply for CEU credits. If you are curious and want to learn more, please contact me. “The time prior to each session was akin to being poised in a doorway: having read Mark’s skillfully crafted writings, I stood, curiously awaiting how these concepts would unfold during that day’s session. Stepping through the doorway into the group space marked the beginning of the alchemical process of discussing the writings, viewing images, and presentation of dreams.